wonderful holiday, it was the best we've had. we rented the house for a family vacation. as there were 17 members in our extended family this house was perfect for us! the owners were really nice and helped us with any request we had. the rooms are comfortable and clean and each has it's own bathroom. the kitchen was equipped for our every need and we used it almost every night to cook wonderful meals. the lower floor and it's facilities- table tennis, pool table and an indoor pool were a great plus for our stay. (the outdoor pool was closed as it was still cold outside). we had a wonderful time and highly recommend this house! Now that we are all back home and unpacked our luggage, I would like to send you and Paulo (the land-lord) few words of appreciation. We had enjoyed tremendously our vacation at the Villa Maria and all what is embedded. To mention only few aspects: the nice and comfortable rooms; the well organized and equipped kitchen; the swimming pool; the surrounding garden and loan; the long dining table; the barbeque 'center' and last but not least - the quiet, pastoral, peaceful and beautiful overview of Umbria. We were, as you know a large family group of 28 people of which 10 are kids. All of us, kids and adults as well, had a wonderful time and cherished every minute. We will remember our vacation in Umbria and Villa Maria for many years as an unforgettable experience. Please forward our thanks and appreciation to Paulo whose friendly hospitality, and assistance, made our stay even better. Nous avons loué la maison d Amelia, 15 jours en groupe avec des amis, nous étions 12 adultes et 10 enfants. La maison est un b&b, qui peut ( comme pour nous) être «privatisé». Chaque chambre (5) a sa propre salle de bain ( douche ou baignoire). Comme nous avions besoin de plus de couchages , nous avons transformé la salle à manger et un grand salon du RDC en « dortoire» pour les enfants du groupe. En plus de la maison principale, tout à coté, se trouvent deux «annexes» identiques . annexes: cuisine ( équipée) salle de bain ,sofa ( dépliable) et en mezanine. La maison est superbe, trés anciene en pierre, il y a un parking ou nous garions sans problème nos 6 voitures. Please pass on my thanks to the owner, we fell in love with the town and the house! We had a very relaxing time. We have now returned from our Italian holiday and we have the following comments to make about the villa. We thought the villa was excellent, clean and well decorated. The garden, gazebo and pool were all very good and the location and directions were perfect. The final comments are made to make this villa 100% --- 1. There should be a kettle to boil water for the making of tea ( for the English ) 2. There should be an iron and ironing board. 3. Your web site includes a microwave oven, but there was not. 4. One chopping board for preparation of food is not enough. There should be one for items like bread and fruit, and one for items like onions and garlic. 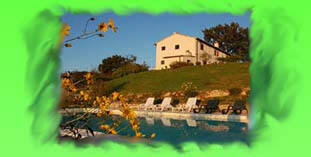 Overall, we were very pleased and would recommend the villa to our friends. We rented this house for one week in July. As the house consists of two apartments (ground floor and first floor), it was perfect for two families. The surroundings were beautiful and the pool area was great. The house owner lives nearby, and is very nice and helpful. They arranged a dinner for us in the house - highly recommended!